It is not only important for Millennial librarians to have a base of literature from which they can draw information, guidance, or inspiration, it is also important for librarians from other generations to understand what Millennial librarians have to offer and how their entry into library leadership will affect the profession. This book, with chapters written by librarians from every generation and from libraries of all kinds, seeks to fill that void. Section I: These chapters focus on the need for a new generation of leaders in libraries. They are written by librarians of all generations who explain why librarians should embrace this change. Section II: In section two, the authors focus on the difference between generations and touch on how librarians must work together to bridge the gap between past, present and future. 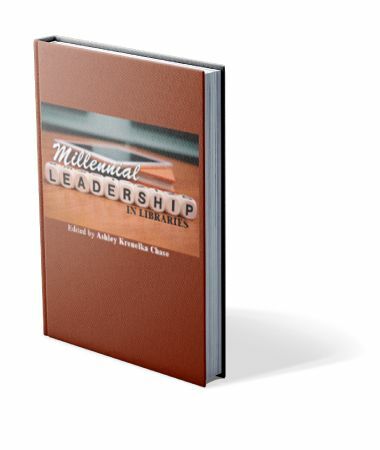 Section III: This section includes chapters which detail how Millennial leaders work in libraries including outreach, marketing, blogging, and collaborating. Section IV: The focus for this section is for current library leaders who are seeking to bring Millennial leaders into the library. Current library administration may have trouble recruiting the younger generation. Section V: These chapters discuss career planning for Millennial librarians. The authors provide information on professional development, leadership training, and alternative leadership skills to the next generation of library leaders. Ashley Krenelka Chase is the Associate Director and an Adjunct Professor of Law at the Hand Law Library at Stetson University College of Law. Ashley is responsible for the administration, planning, management, and supervision of reference and outreach services, acquisitions, library systems, and web page development, as well as teaching Advanced Legal Research. Ashley’s scholarly interests in libraries include the development of leadership and management skills in younger librarians, the evolution of student and faculty research habits and finding clever ways to incorporate emerging technologies into those habits, and her legal scholarly interests include net neutrality’s impact on the criminal justice system.